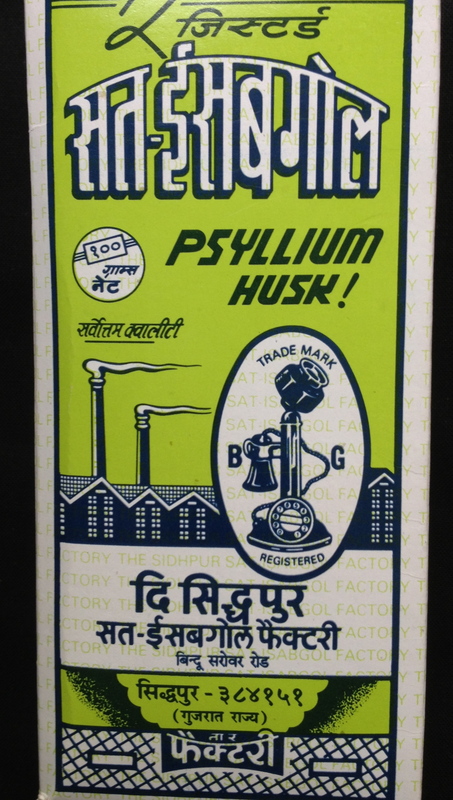 I bought this box for the retro graphics, not having any idea what benefits psyllium husk offered. And what was the significance of the telephone, other than the side panel calls the product the “telephone brand?” Does “Sidhpur” mean phone? And why is the phone a two-handed relic? It probably dates to the factory’s founding, but, Lord have mercy. Love the smokestacks, though…belting out the stuff, huffing and puffing the way the wind blows. About psyllium seed husk. It’s a dietary supplement to maintain or improve one’s gastrointestinal tract. India’s and Pakistan’s answer to Metamucil or Serutan (now dead but an interesting name that spawned “backward” jokes and other similarly-spelled brands), you might say. (Metamucil supposedly contains psyllium husk as its main ingredient.) The milled form here can be mixed with a glass of water, syrup, milk, fruit juice, salted curd or lassi. I didn’t try it, so I’m not sure of the taste, if any. Gluten-free baked goods containing the husks benefit from the latter acting as a binding agent, making bread, cookies and cakes less c–r-u-m–b-l-y. Don’t overdo it, however. Steady exposure to the dust can cause allergic reactions. Consuming too much of the fiber can actually obstruct the GI tract, if you believe the FDA. And, if you don’t mix the husks with enough liquid (1-3 teaspoons per glass), there’s even a choking hazard, especially by people with esophageal narrowing or abnormalities or those who have difficulty swallowing. Which is when and why you’ll need the phone!